Description: One of the most awesome Halloween yard haunts in Los Angeles returns for its third year of haunting. Sherwood Scare is more than a mere decorated yard; it’s a full-blown walk-through terror tour, loaded with monsters and mayhem. Dates for Halloween 2014 are October 17-19, 24-26, 31 and November 1. Hours are 7pm to 11pm, except on Halloween Night, when the haunt will remain open until midnight. There is a special "Lights On" event for Children on Sunday, October 26, from 5pm to 6:30pm. 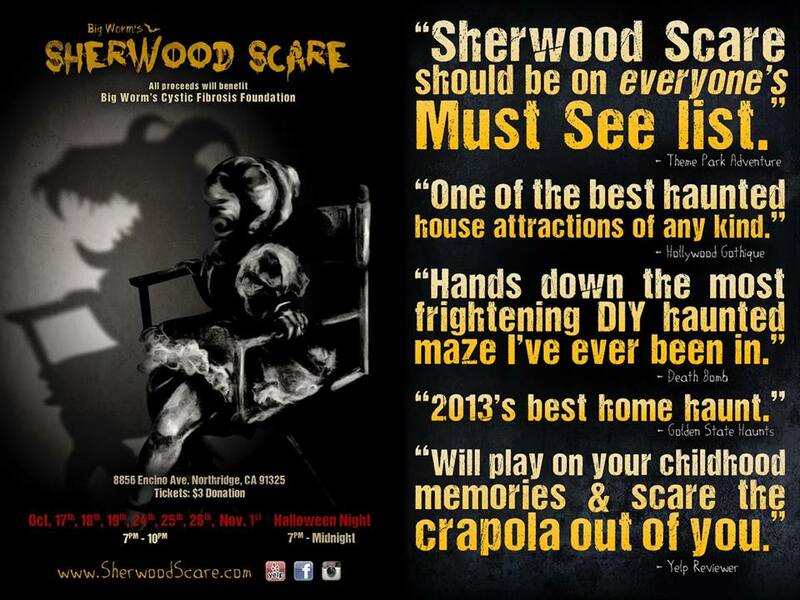 Sherwood Scares charges $3 for admission. All proceeds benefit Big Worm's Cystic Fibrosis Foundation. Looking for more amateur Halloween Haunts in Los Angeles? Check out our pages for Halloween Home Haunts!